Jacquelynn Lalonde draws back the arrow in her bow until the fletching sets even with the determined line of her jaw. She releases it with a soft sharp whoosh of air against feather before it pierces the styrofoam neck of a deer. 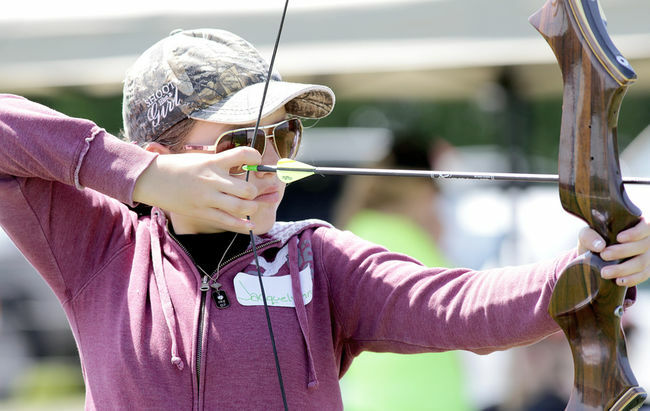 Unflinching, the 12-year-old Kingsville girl sets her bow for another shot. The Lalondes turned the second annual Women’s Outdoor Workshop at the Rondeau Rod and Gun Club Saturday into a mother-daughter opportunity to learn about a number of skills, including shooting guns and bows, gun cleaning, compass orienteering and taxidermy. VanDyk said when she got into the sport of shooting nine years ago there were not a lot of opportunities for women to learn more about guns and shooting. “I fell across another women’s outdoor workshop and I realized I had the connections and I could do it,’ she said. Most of the 62 women at this year’s workshop are experiencing shooting for the first time. Judy and Jacquelynn Lalonde are well versed in shooting, their family hunts regularly but the workshop offered a unique mother-daughter weekend away. Candice Bourque is the polar opposite of the Lalondes. Originally from Toronto, Bourque was convinced by her coworker in London to attend the workshop. She’d never envisioned herself every holding a gun. Her first workshop was with handguns. Bourque said her hand was shaking when she took the gun from the instructor. Then she shot it. “I wasn’t scared anymore once I shot. I felt more confident,” she said. Her fear had turned to something equally powerful. “I’m in love. A handgun addict – that’s what I’m going to be,” Bourque added the course gave her an overall confidence she lacked when she arrived that morning. She intends on returning next year and bringing as many girlfriends as possible.